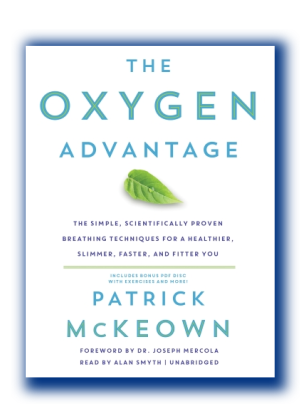 As I study The Oxygen Advantage book I will share some insights and exercises with you from it. From Chapter 2, some explanation of why you may be experiencing heavy breathing during what should be moderate exercise. When your breathing receptors have a strong response to carbon dioxide and reduced pressure of oxygen in the blood, your breathing will be intense and heavy. Your body will have to work much harder to maintain this increased breathing volume, but because over-breathing causes carbon dioxide levels to drop, less oxygen will be delivered to working muscles. It appears that for breathless athletes, our problem is not about getting more oxygen (more frequent and bigger inhalations during swimming) but to train the body to handle higher levels of CO2 and lower levels of O2 in the blood. Through certain kinds of training we can lower our sensitivity to this, which not only lowers the discomfort, it actually lowers our body’s response to that condition, so we just don’t feel the need to breathe as heavy. It has been said that one of the main differences between endurance athletes and non-athletes is their response to low pressures of oxygen (hypoxia) and higher levels of carbon dioxide (hypercapnia). In other words, endurance athletes are able to tolerate a greater concentration of carbon dioxide and lower concentration of oxygen in the blood during exercise. So, how bad is you situation really? Here is the main test that gives us the measurement that all subsequent choices for breath training are based on. You will hold breath for a length of time until the first definite natural desire to breathe (air hunger). You are measuring how soon the first sensations of breathlessness appear. Measuring maximum breath hold is not objective because that time can be influenced by willpower and mental override. The lower the BOLT score = the greater the breathing volume (which is a bad thing); the greater the breathing volume = the more breathlessness you will experience in exercise. Rest for 10 minutes before measuring. When ready, take a normal breath in through your nose. Then allow a normal breath out through your nose. Pinch the nostrils to prevent air coming into lungs. Count seconds until first natural urges to breathe – sensations include need to swallow, constriction of airway, involuntary contraction of breathing muscles (in abdomen or throat). Release the nose and inhale through the nose. Inhalation should be calm – if you need to take a big breath at the end then you held too long. … a problem arises when a BOLT score is less than 20 seconds, as excessive breathing will eliminate more carbon dioxide than the amount that is produced through exercise, leading to a net loss of CO2, reduced oxygen delivery, and constriction of blood vessels and airways. The ideal BOLT score for a healthy individual is 40 seconds, and according to the book, this is a reasonable goal for most people, when following The Oxygen Advantage program. During the TOA training, in every 5-second increase in your BOLT score you should experience noticeable improvements in how you feel resting and in exercise. This person will often experience a hunger for air even when at rest. This person’s breathing may be regular but heavy. There may be a natural pause of 1 to 2 seconds between breaths. This person’s breathing is calm, gentle, soft, effortless, and quiet. The natural pause between breaths is longer. This person’s breathing is calm, gentle, soft, effortless, quiet and minimal. The natural pause between breaths may be 4 to 5 seconds. The number of breaths during rest may be 6 to 10 per minute. Ugh, I need this book. I am not getting enough O2 for what I am requiring. (very sad face). Oh! BTW, Mat, might as well do this here. My homework! Three things that have improved in my freestyle with Total Immersion Training: Head is staying “deeper” in the water….. at least until I go on auto during a set at Masters…. Second thing: There are moments when I feel the “grab” that I am looking for, the actual sensation of holding the water. This still requires a lot of concentration, but less than when I first started. Third thing: Oddly enough, I think this has improved my backstroke, which is my strongest stroke. I am swimming taller in the water, with head much more submerged. My neck and shoulders are more relaxed. Backstroke! Yeah, now I’m thinking “Duh…. I can breathe more, even though my sense is it still isn’t relaxed or conscious breathing. I want this book. It is a bit shocking to realize something we think is all ok (automatic breathing) is actually not as good as it should be and there is something we must learn to do it better. There is a lot of relationship between backstroke and ‘front’ (crawl) stroke. It is great that you have immediately noticed the mutual benefit of the changes you’ve made. Sadly, the issue is “performance anxiety.” Ish. So, I got nervous taking the BOLT test the first time, and so felt the need to take a breath around 14. Ten minutes later, after thinking about other things and deciding, “Who cares,” I got 35. I do remember hitting my ceiling in high school for a while, in freestyle. I could do 4-25s with 3 seconds rest in between and each one was 14 seconds. When doing a straight 100, I was always right around 1:02ish. That was with workouts twice a day, 6 days a week. And yes, a long time ago, but I see people 10 years older than I who are taking off time, and a big part of it is breath, I am sure. Anyway. Anxiety. The bane of my existence. Leads to tension, breath holding, feeling “weak.” I would sometimes swim slower in meets than in practice because I was so anxious, and would have to pee every 15 minutes. No exaggeration. I am noticing this now as well. This could be part of your training as well – to create a routine that brings you into the state you want at the start of a race and program your moves, even down to the breathing pattern you use coming to the blocks and even during the first length of the race. This could prime your nervous system and mind to fall into a chosen channel of focus and controlled effort. Got times from 32s up to 38s. Daywhile at desk or armchair the times are from 25s to 35s varying, especailly when not taking time to calm down 10min. Frequenzy in the morning flat is 8-10 per Minute, daywhile 9-12. Feels as if the frequenzy doesn’t change much with low loads, just take deeper breaths.